At their May 9, 2016 meeting, Linden City Council once again postponed action on Resolution 03-16 regarding application the Texas Main Street Program. A copy of the Resolution discussed initially on April 11, 2016 follows. “WHEREAS, the City of Linden had decided to invest in revitalization the downtown business district. 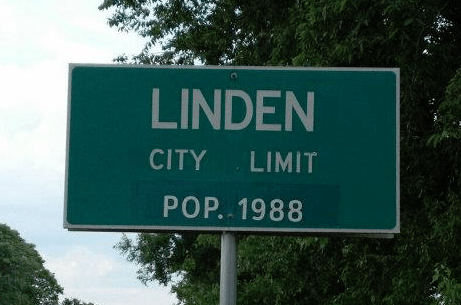 WHEREAS the historic nature of the City of Linden would make it a good candidate for entering Texas Main Street Program. WHEREAS the Texas Main Street program requires an extensive application the City Administrator will assemble a committee capable of completing all the separate portions of the application and submitting it prior to the deadline for 2017 Main Street acceptance. WHEREAS the program requires a budget commitment of three years the City will commit to a $50,000 annual budget including both salary and initial budget for a new Main Street Manager. To keep the City budget balanced the City will regretfully no longer be able to pay 1/3rd of the Linden Economic Development Corporation’s salaries. The City will also attempt to establish an Emergency Services District. Total savings in these two changes will equal or exceed the $50,000 requirement. Note that there is a risk in that the ESD could be voted down and the City would still have to count on other cuts and growth in tax revenue to make up the remaining $20,000. Jerry Harp has given the Foundation permission to use his Facebook post from May 10, 2016 which provided the following description of the Council proceedings. “The Linden City Council met in regular session on May 9 at the Senior Center. There were about 25 people in attendance. After the opening prayer and pledge, Jeanie Stevens and Ruth Halleck spoke in favor of the Main Street program. Emily Braswell Henderson gave a report on LEDC finances. Sue M. Lazara questioned a $10,000 deficit noted in the printed report. Mrs. Henderson stated that she would have to get back with Sue on that. City Administrator Bob Swisher then addressed the Main Street program, stating that to kick it off, $50,000 was needed. He suggested that $28,000 of city funds be taken from salaries paid to LEDC employees, and that the agency make up the difference from their non-city funded revenue sources. Larry Wells, LEDC board member, and Mrs. Henderson noted that removing the salary supplement would very likely hinder LEDC actions in the community. A motion to table this idea was made by Kenny Hamilton and passed 3-2. The Administrator is to meet with the LEDC board and report back in 2 weeks to a special Council session. The deadline for the complicated application for the Main Street program is July 29. Only 89 cities in Texas have been accepted. It is a BIG deal. Mr. Swisher then presented the extensive list of goals for Linden 2025. This roadmap of improvements for the city was approved. Joe Lovelace, Linden Heritage Foundation, presented colorful architectural renderings of how the historical fire house and water tower might look one day as funds become available. He noted that this would integrate nicely into the Main Street program. Mr. Swisher reported that negotiations were underway with Etex to have fiber optic cable laid for city hall and the new police station, giving them much higher and more reliable internet speeds. Windstream was not being particularly co-operative. Public works director Robert Luzio reported a major water main break had caused low pressure city wide. Due to recent rains, several major culverts had washed away, requiring asap replacement. Mr. Swisher reported that there was a chance of cost recovery from FEMA. Alton McWaters, police chief noted there had been 28 traffic contacts, 159 calls for service, and 3 arrest during April. The department is in the process of moving into their new facilities purchased by the city from ETMC. The building is behind the closed hospital. The text of the recommendation by the Linden 2025 Committee supporting the City’s application to the Main Street Program follows. 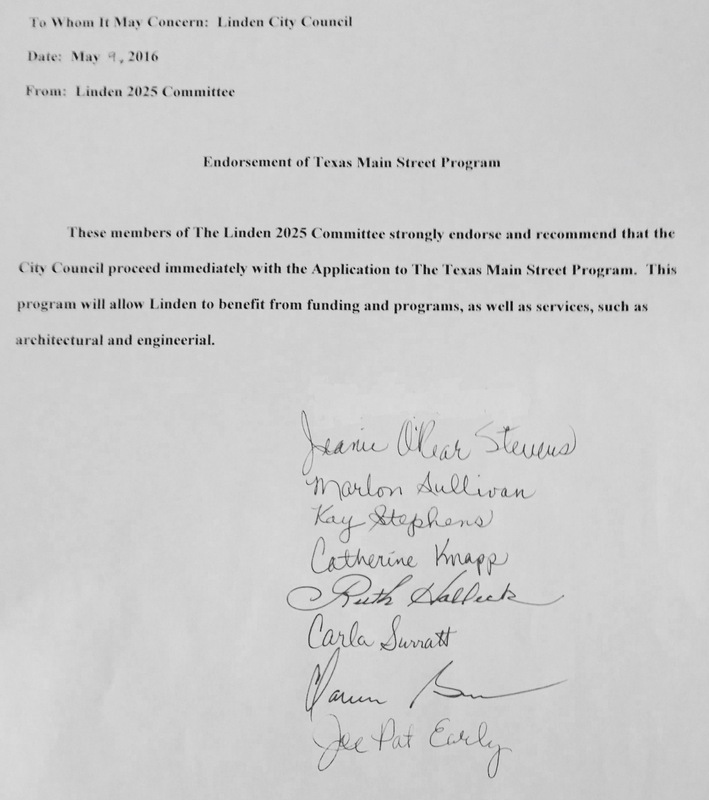 These members of The Linden 2025 Committee strongly endorse and recommend that the City Council proceed immediately with the Application to the Texas Main Street Program. This program will allow Linden to benefit from funding and programs, as well as services, such as architectural and engineerial. Click image of letter on left to view a photograph of the original document. The Council will reconsider the Resolution at their next meeting scheduled for May 23, 2016. It is important to make everyone aware of their actions; and encourage Linden residents to express their opinions to members of the Council and Linden Economic Development Corporation. Help them understand that participation in the Texas Main Street Program is critical to the revitalization of Linden.